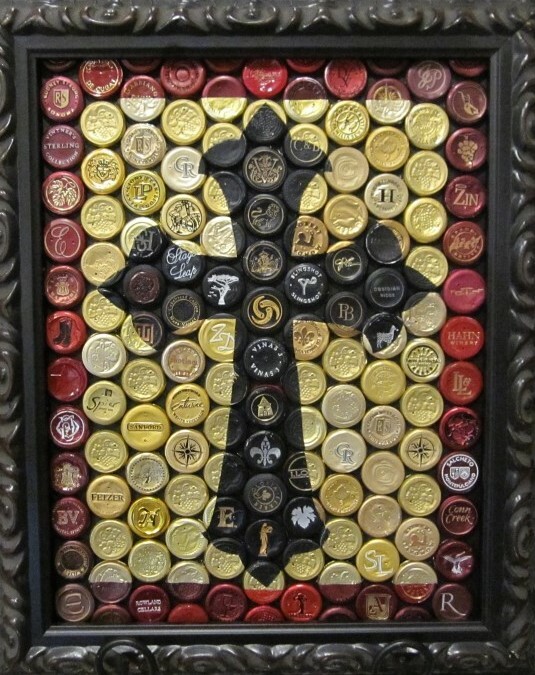 Today on Rockin Red Blog I would like to introduce you to a friend of mine who is a wonderful wine artist. His name is Ryan Sorrell. I met Ryan through social media and was immediately impressed with the pictures I saw of his art. After months of planning my husband and I finally met Ryan and his wife along with other Dallas area social media wine friends. We now try to meet as our schedules allow for lunch with the “Dallas Wineauxs” or for dinner and great wine. Ryan and his wife are kind, fun and authentic people and we feel blessed to have met them and now call them friends. However, there is much more to this story…. Ryan is a gifted artist. 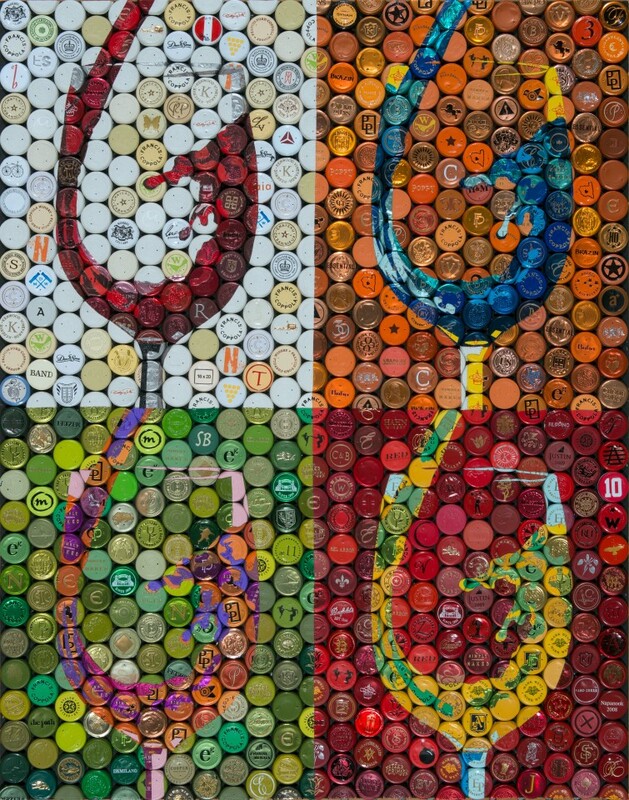 He crafts unique works of art from the capsules (or foils) on the top of wine bottles. Seeing images of his art on his site Vino Mosaics is to get a glimpse in the unique nature of his medium. However, these photos do not do justice to the extraordinary 3-dimensional creations Ryan produces. 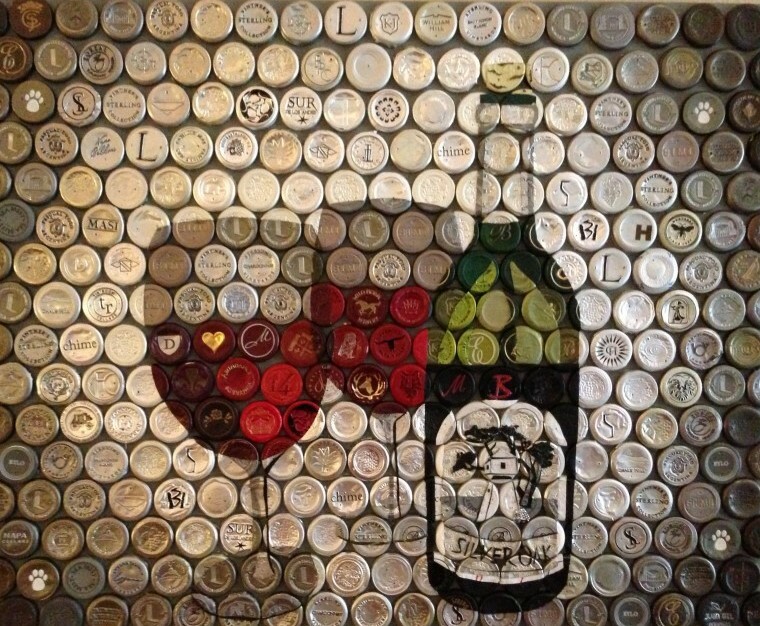 As you view his art please keep in mind each mosaic is crafted ENTIRELY of wine foils! So as you see shadowing or colors blending into other colors Ryan has done that entirely with foils, no paint, no ink, no other material. 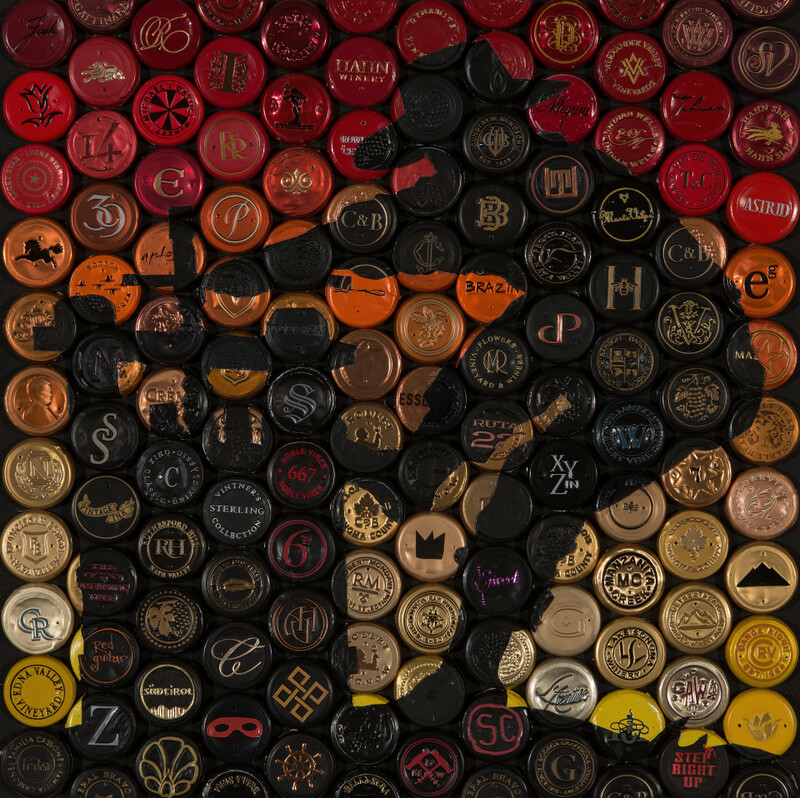 The absolute best way to enjoy Ryan’s Vino Mosaics is to purchase your own and hang it in your home, office, restaurant, bar, etc. 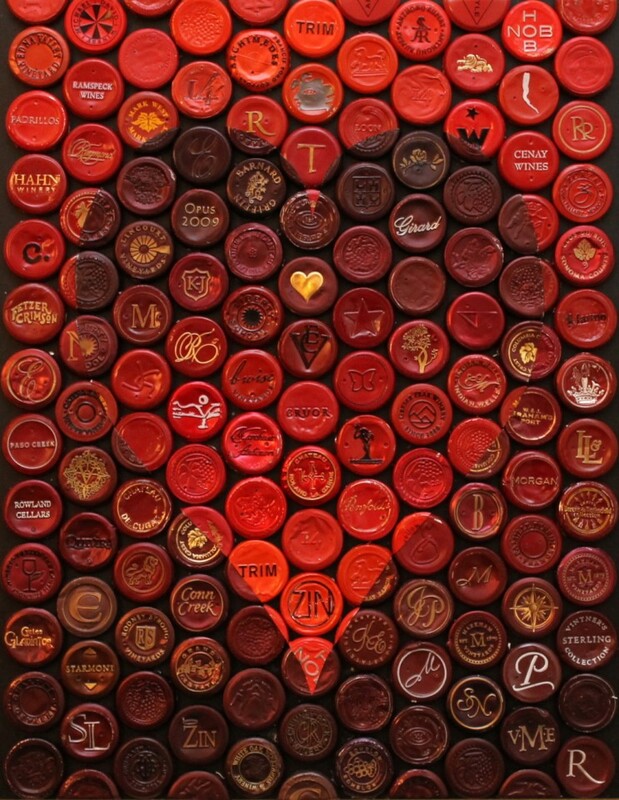 I can assure you your own Vino Mosaic will not only make a lovely edition to where you chose to hang it, it will also be an endless conversation piece for all who see it. Me: Your web site explains you were inspired by mosaics while you studied in Italy. What did you study in college that took you to Italy? Where did you live in Italy and how long were you there? RS: This was a semester abroad program for any student to take their basics (art appreciation, music appreciation, western civilization, and Italian 101 of course). What a way to get your base classes covered! 40 students lived in a 16th century villa in Florence and we would travel to art galleries and cathedrals all over Europe to experience great works of art first hand rather than in history books. Me: Were you an artist before traveling to Italy? RS: I was not an artist but I’ve always been creatively inclined I guess. The time in Europe definitely fueled that creative desire in me and I developed a great appreciation for the “Renaissance man” who brings creativity and innovation to many different endeavors. Me: You discovered a love for mosaics in Florence and Rome. Which ones in particular inspired you? Me: Did you also discover a love for wine in Italy or were you a budding connoisseur before you lived there? RS: I didn’t appreciate wine until I went back to Italy for my honeymoon years later. The great thing about Italy is that the table wine of just about any osteria or trattoria you pop into on a whim is usually fantastic stuff! But we have also had a seven course wine-paired meal in Montalcino that was world class. You simply can’t go wrong in that country. Me: Please share with us a bit about your wine likes. What wine would we most likely find on your dinner table on any given weeknight? What wine is your weekend wine? What is your “ah-ha moment” wine, meaning the best wine you have ever consumed? 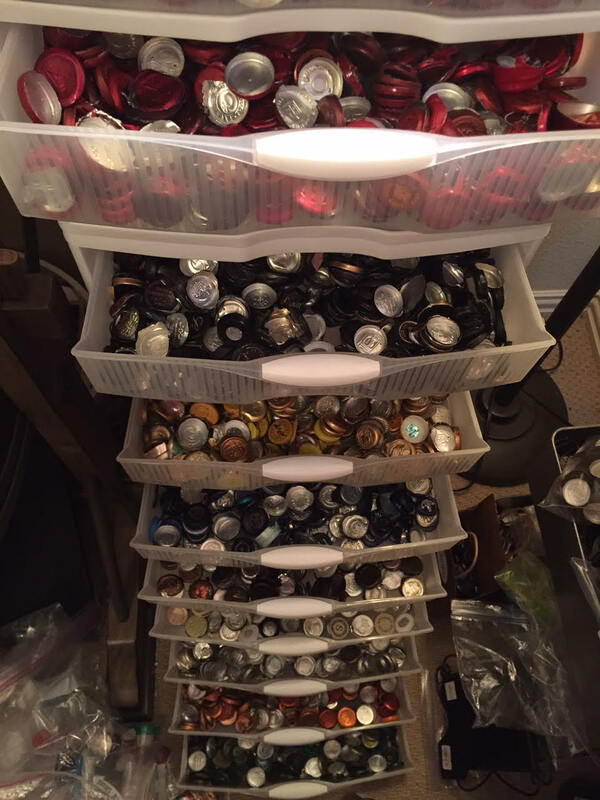 Any new finds or discoveries as you sip for capsules? RS: Wine for me is heavily influenced by travel. I like the memories and feelings that wine invokes so I am typically drinking wine from a winery or country that I have visited: A Sonoma or Oregon Pinot Noir during the week, a big Bordeaux or Napa Cab on the weekend, Brunello or Barolo for a special occasion maybe. Our bank account definitely does not keep up with our tastes unfortunately! I’m ashamed to say I have purchased a bottle of wine solely for the cap before. That is not a solid business decision but sometimes you need just the right color! Me: You clearly have a passion for art and wine and have brought them together in a way that is unique and beautiful. 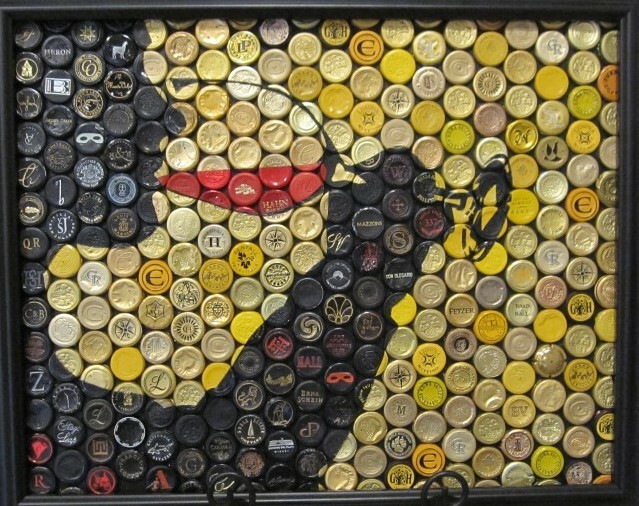 How much time passed after your return from Italy before you found inspiration in wine art? Did you try other mediums before discovering capsules? RS: I am a one-hit-wonder in that regard. I was not pursuing art in any way but we were visiting my parents after our honeymoon in Italy. My parents are big wine enthusiasts and they happened to use a foil cutter and collected their foils in a large crystal vase on their wine bar. 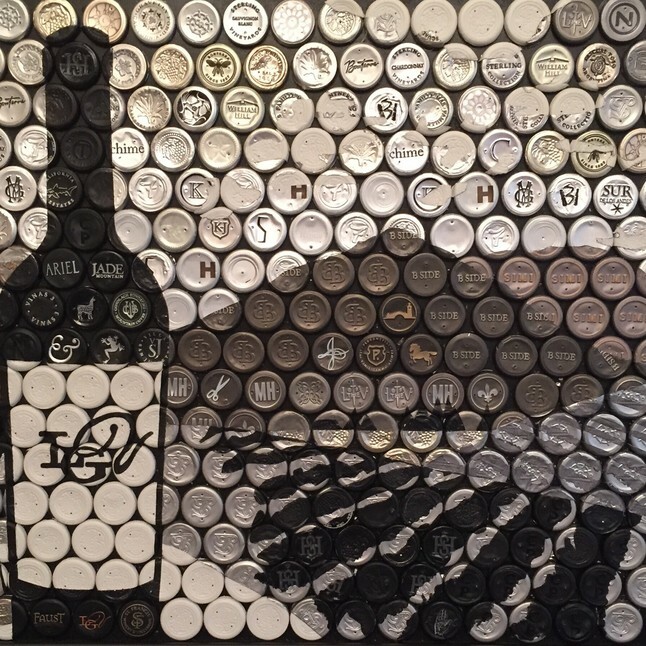 It struck me that, due to the foil cutter, the wine caps were very uniform and about the size of a mosaic tile. There were so many colors and shades and various designs I thought they would be a great medium for art if you could collect enough and make them sturdier. Years of R&D (research and drinking) ensued until I had a good process. Me: Each of your Vino Mosaics are so unique, what is your process for creating one of your works of art? RS: I have a few guiding principles that hopefully make my work consistent, unique, and recognizable. First, I never use paint in any way. Second, I try to design each piece so that the wineries/brands remain recognizable on the cap. Third, I try to include as many different wines as possible so that the viewer will always see something new or a winery that they know. My intent is for each mosaic to be a great conversation piece for years. Me: Creating each Vino Mosaic appears so time consuming. Have you found a way to replicate them or is each patron receiving an original? RS: Very time consuming. Surprisingly most of the work involved is in the preparation phase. Most foils have to be reshaped and trimmed to achieve a consistent size and appearance. Then they are filled with an epoxy to solidify them as tiles. Next they have to be affixed to the surface of the piece in the proper order so that the color scheme of the design matches up to the eventual overlays. As a result, every Vino Mosaic is unique. I have begun to offer high definition prints, or Giclée, as an affordable option. I print them on metal paper and coat them with a 1/4” of plexiglass which really makes the colors pop. I think they look fantastic for a fraction of the cost of an original. Me: Let’s talk a little bit about inspiration. Of course your “Fiery Red” is my favorite. What inspired it? RS: Fiery Red came about after my first trip to Napa. Up to that point my pieces were fairly small and simple design-wise. I wanted to challenge myself and push the envelope of what could be achieved in this format. 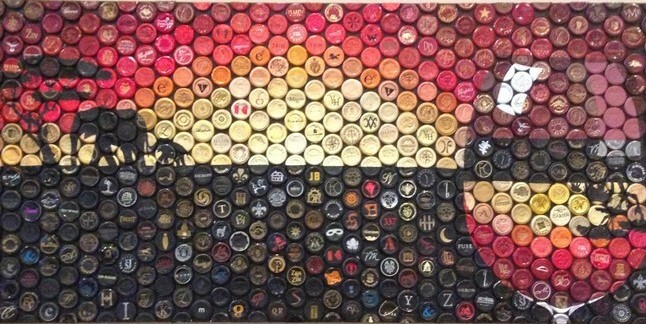 The project took two months and required over 1000 wine caps. I had a lot of regret in the middle of working on that piece because I wasn’t sure how it would ultimately turn out, but I was really pleased with the end result. Capturing the action of wine pouring into the glass is something that appeals to a lot of people. I think we just connect with that experience. Me: Your muted toned Laurel Glen Vineyard work is so lovely. What inspired it? Why did you chose to craft it in grey scale? RS: The people at Laurel Glen are so great to work with. They gave me complete license to create what I wanted for them. To me Laurel Glen Vineyards is classy, venerable, and focused with their single vineyard Sonoma Mountain cabs. I wanted to capture this feeling like Audrey Hepburn in a classic black and white film. The image is actually their label deconstructed as the background. Me: South African Sunset Chardonnay is beautifully three-dimensional. What inspired this mosaic? RS: My parents had taken this 3 week trip of a lifetime to South Africa. They were most impacted by their experience with the elephants there and one of their stories conjured a picture in my mind of sitting on a deck with a glass of Chardonnay watching the elephants on the savannah at sunset. I created this piece for them to commemorate their trip and even used some South African wine foils that they had brought back. One special element of that piece is along the bottom. My mother was an elementary school teacher and somehow I found a foil for each letter of the alphabet to honor her! 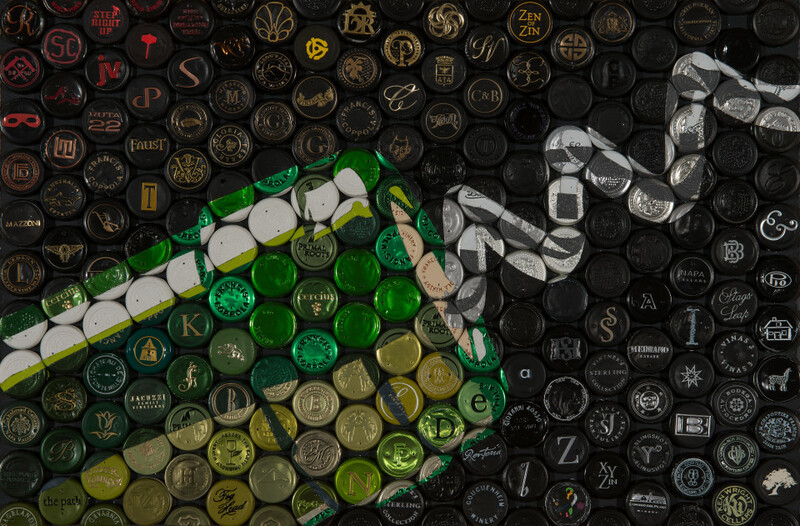 Me: In addition to your original images will you create a custom Vino Mosaic at a customer’s request? How long does it take you to craft each mosaic? RS: Yes most of my pieces are custom commissions. Time generally depends on size and can be anywhere from two weeks to two months or more. I usually interview clients prior to starting a custom piece so that I can incorporate special, meaningful, or symbolic foils or those from their favorite wines and destinations. This ensures a truly one of a kind and deeply personal conversation piece. 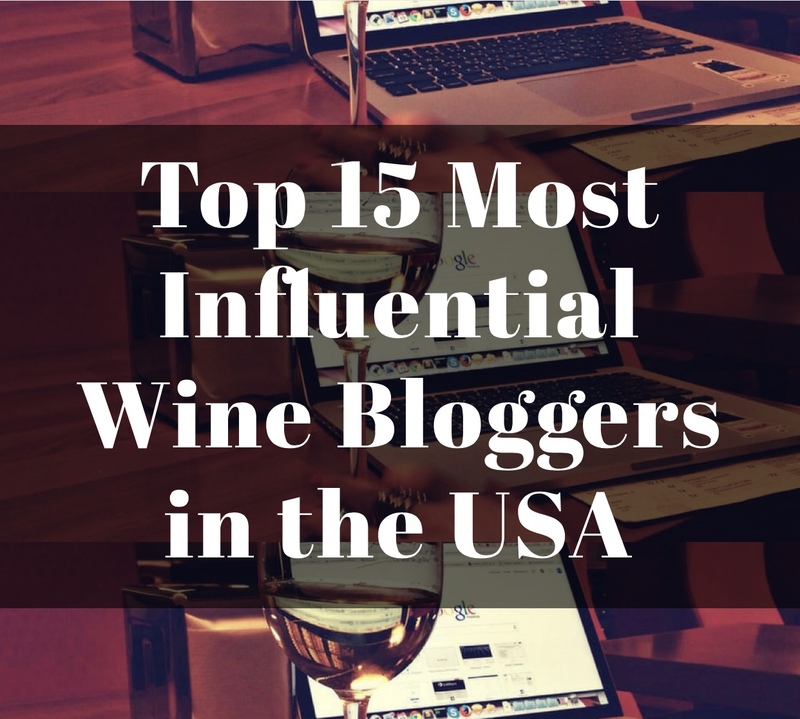 Me: I like how you feature the wineries who support you with their capsules on your Vino Mosaics web site. It is a very impressive list in both size and quality. 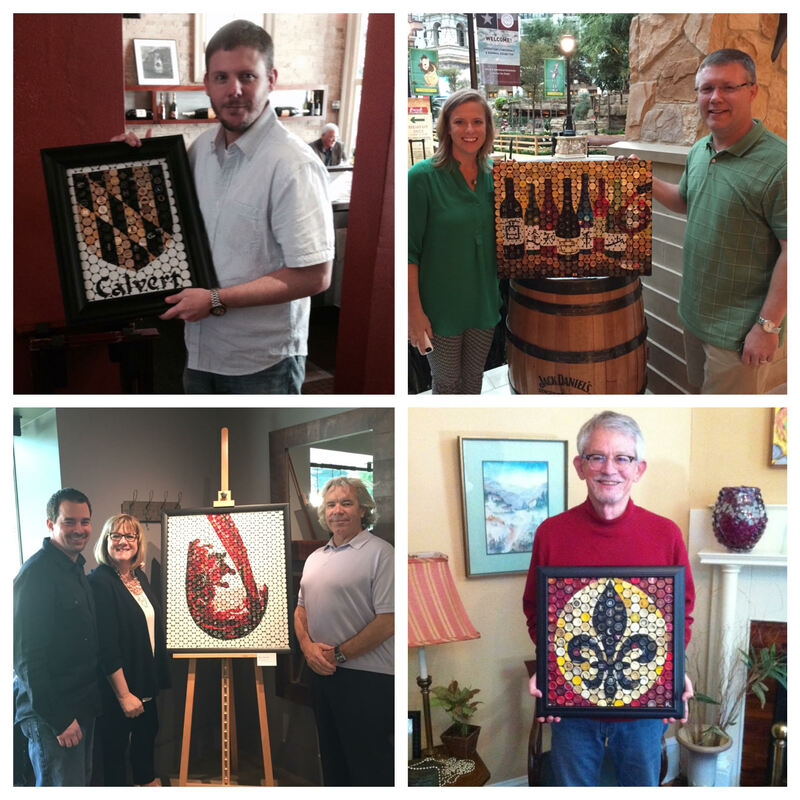 Is your work featured in any of their wineries either on display or for purchase as well? RS: I have to say, people love hearing the stories of the wineries in my art work almost as much as the art itself. Often times there is an interesting inspiration behind the design on the cap that is fun to tell. Each featured winery is a place that I have personally visited and often I have met the owner and/or wine makers so it brings a very personal touch to each mosaic. Obviously I can’t do this work without the wineries so I work hard to promote them through the art. Me: How many capsules on average does it take to produce a Vino Mosaic? 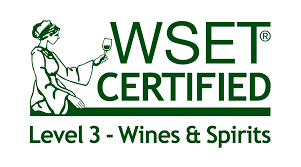 RS: Generally the wine foils are 1 inch squared so a 16”x20” piece will require at least 320 wine caps (16 times 20) to complete. Probably 400+ after all the overlays. That’s a lot of wine! Thankfully I don’t have to drink it all myself. I collect foils from friends, family, restaurants, wine bars, and wineries. Me: Since beginning Vino Mosaics have you returned to Italy to revisit your favorite mosaics? RS: I haven’t! Kids have kind of postponed our international travel but they are finally getting to the age where we want to take them to Italy and share our love of the culture. Our daughter is named after the town of Siena so she cannot wait to go there. Me: How can my readers purchase their own Vino Mosaics? RS: I have a few originals and prints available for sale on VinoMosaics.com. Those interested in commissioning a custom mosaic can contact me directly through the website. Me: What does the future hold for Vino Mosaics? RS: I want to keep pushing the envelope from both a design and size perspective. I would love the challenge of a really large installation at a winery. I also hope Vino Mosaics takes me to experience many different wine regions around the world just as I have made so many good friends in Napa and Sonoma. 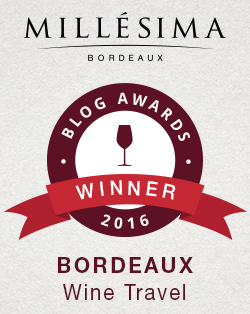 Me: Since this is Rockin Red Blog you know we are all about pairing wine with music. I typically pair a song with the wines I review. However, since you are my guest would you please select the song you want to pair with Vino Mosaics? RS: I typically work on my art late at night with music on and a glass of wine. The music depends on my mood but usually its contemplative. Joshua Radin is an artist that I really like. I think I would select his song Beautiful Day that he performs with Sheryl Crow. The three of us do great work together! 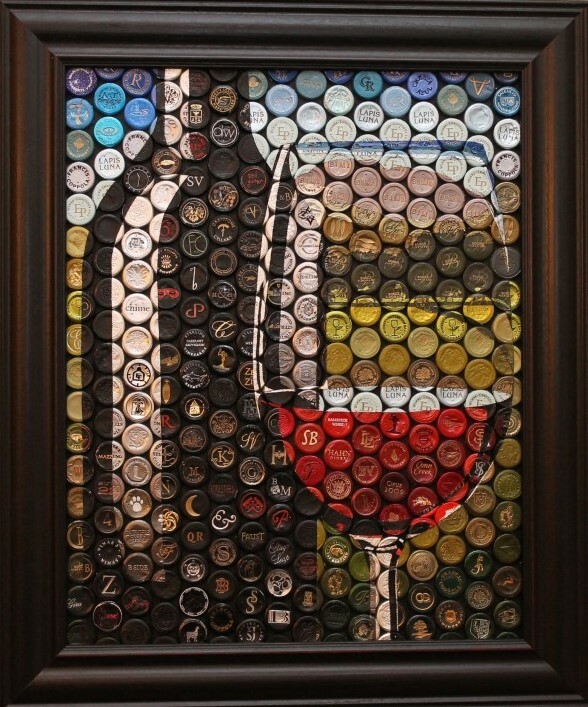 As you can see Ryan’s Vino Mosaics are perfect for any wine lover. They are great additions to your home, office or anywhere you would like to display, and they are great conversation pieces. 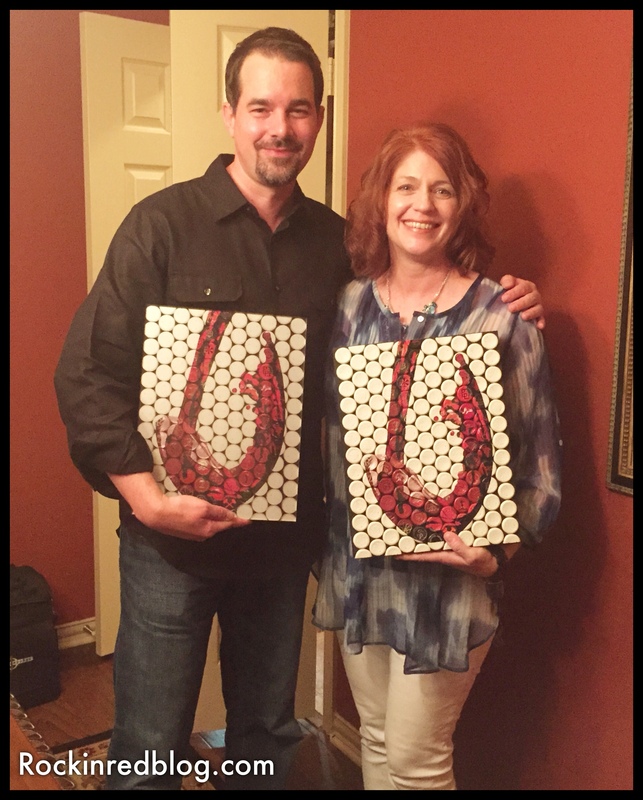 You can customize your own or order one from the selection on Vino Mosaics web site; the sky is the limit so order one for yourself or as a perfect gift for the wine lover in your life! 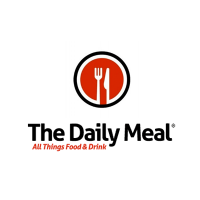 For a limited time only Rockin Red readers will receive 10% off any acrylic Vino Mosaic (held by Ryan in the picture at the beginning of the article)! 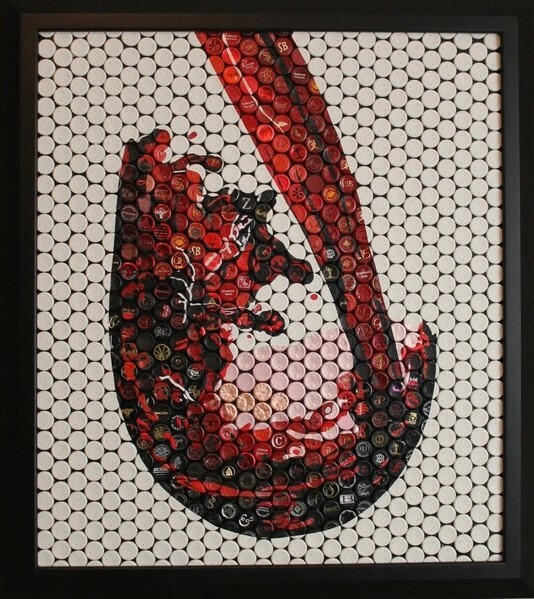 Simply use coupon code ROCKINRED on the checkout page of Vino Mosaics web site. Order yours today! Get your own Vino Mosaics and let me know what song you pair with it. Cheers! Previous “The Winds of War” Live-blogged, 8: Honeymoon in Lisbon, wine in Boston! I love all of Ryan ‘s pieces, but the Winemaker one is my favorite. Definitely one day, we will own one. And Ryan- still saving foils for you! Great article Michelle! Thank you Lori. His art is amazing! Yes, and a photo does NOT do them justice. What a wonderful concept and I really love his work. Thank you Michelle for sharing this with us. This completely blew me away! What an awesome artist, and I appreciate you sharing his work with us. Great interview, too.